At 3 am, on the 8th of December in Azzun whilst the Radwan family slept, dozens of Israeli soldiers surrounded their house and broke in. They damaged the door as they entered, sweeping through the house and also breaking the doors of the kitchen cupboards. They ushered the nine family members into one room and forced them all sit on one sofa at gunpoint. The mother, speaking to ISM volunteers the day after her home was invaded and her sons arrested, recalled that there were too many soldiers to count that night. They were everywhere, all over the inside and outside of the house. The soldiers took everyone’s mobile phones and the hard drive from their computer. They asked for seventeen-year-old Abdallah first, ordering another brother to get clothes and shoes for him. No one was told what was happening or why. The army then told the mother to say goodbye to her seventeen-year-old son, but he was surrounded by soldiers so she could not reach him or see him. She was was only able to cry out “ma’a salama!” – goodbye. The soldiers then asked where 20 year old Mohammed was. They ordered his clothes and shoes to be brought as well. Again his mother was told to say goodbye, but again she could not because there were so many soldiers in the way. Neither the family nor the boys were told why they were being arrested or where they were being taken. The ordeal lasted two hours. By 5 am, the army left and the family watched soldiers jumping from their roof and leaving from all sides of the house they had been surrounding. The Radwan family lives in Azzun, a Palestinian village of about 12,000 people near the city of Qalqilya. 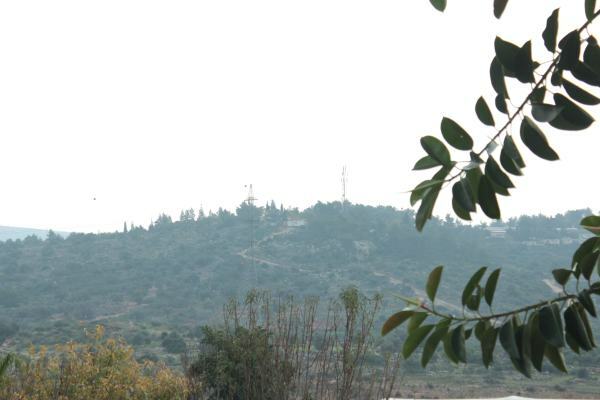 Several illegal Israeli settlements surround the village, including Ma’ale Shomron, Ginot Shomeron and Alfei Menashe. The settlements encroach on Palestinian land, taking more and more each year. The Radwan family’s home is at the far end of the town, the closest house to the Ma’ale Shomron settlement. It is constantly targeted by the Israeli military and settlers. CCTV cameras watch the house constantly, even as settlers and Israeli military attack the area with impunity. motivation to go back to school. Released prisoners and their family members are also unable to obtain permits to work in Israel, making employment opportunities even more rare. 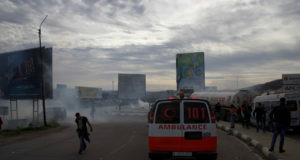 Every year about a hundred and seventy Palestinians are arrested in Azzun. Around seventy of the arrestees are under the age of sixteen. Some are imprisoned for ten months, others for one to five years. Prisoners have reported suffering torture, including isolation for weeks at a time. Since Abdallah and Mohammed were arrested, their mother found out that her sons are being detained in Al Jalama prison, Haifa. 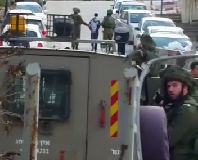 Israeli forces have given no reason for their detention, nor set a date for their trial. 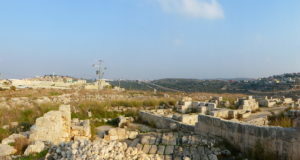 Photo shows the illegal settlement of Ma’ale Shomron, this is the view from the house where the boys were arrested (photo by ISM).